Like many of the best home cooks, Helen Tindale, spent her early years travelling with her family, settling wherever her father’s Foreign Office job took him. The peripatetic lifestyle left young Helen with a wide-ranging palate and a deep curiosity about food and cooking. Back in UK to study landscape gardening, Helen side-lined as a cook for directors’ dining rooms, and when her daughter started at primary school she did a training course for public service cooks, thinking it would be convenient to cook in schools. Then along came Jamie and school dinners became a political hot potato. Helen decided on direct action and invested in her first Nice Green Van, strategically parked to divert children en route to the junk-food corner shops with her offer of something healthier. Soon the Nice Green Van found itself in demand catering for events, so when the café franchise at Cecil Sharp House came up Helen spotted a Nice Green Challenge and, in October 2010 she opened a cafe in the basement. Built to promote English song and dance, Cecil Sharp House has a wide-ranging clientele. Strictly Come Dancing rehearse there, as do the English National Opera, and recently it was the venue for a vintage fashion fair, for which Helen served a ladylike set tea. Preheat the oven to 170C/gas 3. Butter a 23cm diameter, loose-bottomed deep cake tin and line with non-stick baking parchment. Beat butter and sugar together in a large baking bowl until pale in colour and light in texture. Crack the eggs into a smaller bowl and beat together lightly with a fork. Add the egg in small batches to the creamed butter and sugar mixture, beating well between each addition. Keep a close eye on the mixture in the latter stages, and if it begins to “curdle” or separate out, add a tablespoon of flour and carry on beating. When all the egg is incorporated, mix cinnamon into flour and fold into the cake mixture with a metal spoon. 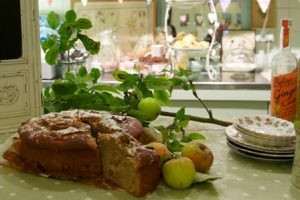 Fold two-thirds of the chopped apple into the cake and tip the mixture into the lined tin, spreading lightly with a spatula or back of a spoon. Scatter the remaining pieces of apple on top of the cake, which will rise to embed them. Bake for 60-75minutes in the middle of the oven. To test push a skewer into the centre of the cake – when it comes out clean the cake is done. Remove from the oven and leave to cool for a few minutes before pressing the bottom of the tin to release the cake. Transfer to a plate and gently pull away the baking paper. Sprinkle icing sugar lightly over the cake and serve in generous wedges. 2 Regent’s Park Road, London NW1 7AY. Depend on what is on at Cecil Sharp House, so it is safest to ring and check before you set off for The Nice Green Café.